Casablanca, Dominica, oceanfront guest villa, Guest Book, Commonwealth of Dominica, English speaking East Caribbean island, West Indies. 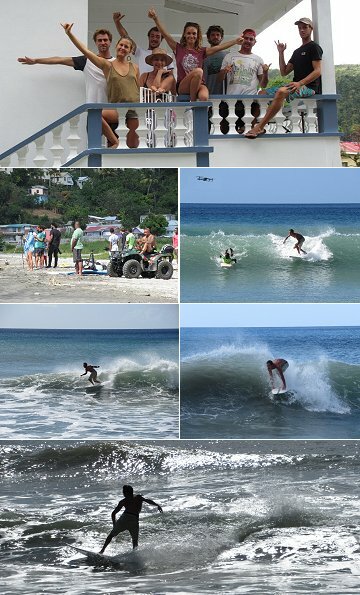 Casablanca has been available as a guest cottage for visitors to Dominica via the services of Nature Island Destinations Ltd. since 2000 and has been a popular choice, seeing many repeat visitors return annually. On completion of clients' visits, feedback is often sought from them. Not all respond but a few do and below are some of the replies received or extracts from them, most recent appearing first. Andy, a Geordie living in the south of France, visited Dominica in late February 2019 with his friends from Durham, France and Guadeloupe. They spent their week at Casablanca.They hired a vehicle to get around and see some of the sites. 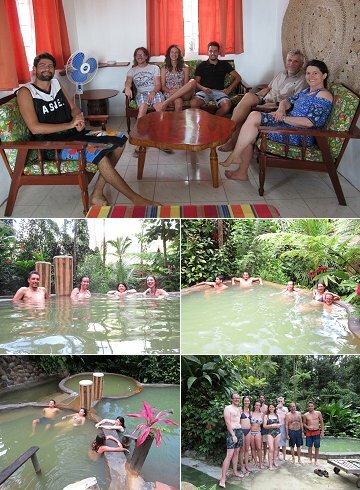 One day we joined them for an outing at Bongo Baths, a tastefully designed and landscaped hot sulphur springs spa at the village of Wotton Waven, with a variety of pools of differing size and temperature. Below is what they had to say on returning home, along with some photos I took both at Casablanca and relaxing in Bongo Baths hot pools. Colin's house is a comfortable and very clean house where you will find everything you need for your stay. In addition, the view from the balcony of the house is beautiful and very relaxing. A beach with snorkelling possibilities is nearby, as well as at least two good restaurants. Colin and his wife, Cecily, are available and very welcoming. We enjoyed the opportunity to book a local meal prepared and delivered to the house by a friend of Colin and Cecily upon our arrival. Another nice touch and practical; the provision of a local mobile phone very useful for communicating with our hosts and for booking different activities while our 'European' phones are very expensive to use outside the EU. Pierre and his friends from France and Martinique are a group of surfers who have forged a link with the west coast village of Layou, to which they gave support following Hurricane Maria in 2017 and have since helped form a surfing club there. In January 2019 they stayed at nearby Casablanca whilst teaching young Dominicans how to surf on surfboards they have kindly donated. They also hosted a surfing competition. This is what they had to say after returning home. If you travel with a group and are looking for a place to crash and visit the beautiful Caribbean coast of Dominica, Casablanca house is the perfect spot ! The view is just unbelievable ! Colin and Cecily are adorable and will let you know everything you need about the area ! They've been really helpful ! We will never forget this trip and will be back soon ! Xavier & Joanna are newly-weds from Asheville, North Carolina, USA and chose Dominica to spend their 16 day honeymoon in March 2013. All but their last night, which they spent in the NE close to the airport, was enjoyed at Casablanca on the mid west coast. We had a small Suzuki jeep rental awaiting them on arrival at the airport and arranged a whale-watch boat outing and a Syndicate bird tour for them during their stay. This is what they had to say after returning home. My husband and I spent a lot of time searching out the perfect honeymoon destination before settling on Dominica. 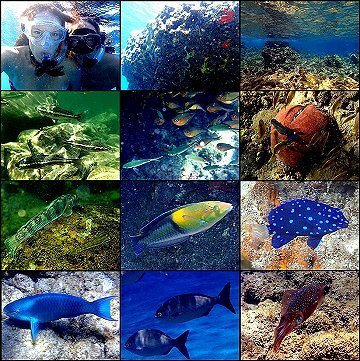 We were looking for a place we could get away from the tourism of other islands and snorkel to our hearts content. I finally stumbled upon Dominica in an article. It seemed perfect, but I didn’t know where to start looking for places to stay or how to decide which side of the island to stay on. After weeks of searching, I was still uncertain about logistics and details. Then I stumbled across Nature Island Destinations and found all the information I was looking for in one place. I contacted Colin and told him what we were looking for and what we were interested in. He found a house rental for us in our price range and by the beach. He arranged a car rental and activities for us based on our interests. Everything was easy and low-stress and all we had left to do was wait! Upon arrival, our car was waiting and we took the adventurous drive to our rental. Colin greeted us and made sure we had everything we needed, down to the last detail. There was food waiting for us in the fridge and even a fresh papaya from Colin’s own tree. We felt right at home and when we woke up at Casablanca we made fresh papaya smoothies and revelled in the view of the sea. Our trip was perfect and relaxing from start to finish. We fell in love with the island, ate delicious fresh food, met wonderful people, and had amazing experiences. The activities Colin recommended (from the best bird tour I could ever imagine with Bertrand to soaking at Screws hot springs) were fantastic. Each day held an adventure that left us feeling more and more like moving to the island! I can’t say enough about how amazing our trip was and how hospitable and wonderful our experience with Colin and his wife were. We left Dominica with new friends and a great love for Dominica. I wholeheartedly recommend trusting Nature Island Destinations with the details of your trip to Dominica! Winston and Kathy are from Barbados and visited Dominica for the first time in April 2012 with their 7 year old daughter, Whitley. Due to their evening arrival and early morning departure we arranged their first and last nights at Coffee River Cottage, not far from Melville Hall Airport on the NE coast. The balance of their stay was at Casablanca. They enjoyed Dominica so much that they are now considering purchasing property here. Let me express my overwhelming satisfaction with our stay in Dominica. Winston, Whitley and I had a blast! Staying at Coffee River Cottage for our first and last nights as you recommended was a wise choice. The accommodation there was charming, Sandra and Stephen were great hosts, very helpful and cordial, the beautifully landscaped grounds and the river....nature at its best. Casablanca was excellent for getting around to other parts of the island and the accommodation there also surpassed what we had anticipated. The view of the sea and the beautiful sunsets from that ridge was a plus. It was a pleasure meeting Ivor, very friendly. On behalf of my family I thank you for your excellent service and special thanks for the vehicle rental. You helped to make our stay on the island a comfortable one and I've already recommended your service and website to others. We will definitely be returning in the near future and will require your services again, hopefully sooner than later. Give my regards to Cecily and thank her for her helpful recommendations. Winston and I have a very keen interest in acquiring property on the island. Thanking you again and keep up the good work. Jack is a recently retired electrical engineer from Guildford, Surrey, south east England. He has been visiting Dominica on vacation at least once a year for the past 15 years. His friend Paul, a partner in an exhibition lighting company in Guildford has joined him for the past 6 years. Though they have stayed at various lodgings, their favourite is Casablanca, where they have spent many winter visits of three to four weeks. Set in a garden on a clifftop overlooking an impeccably blue and glassy sea, it is wonderful to return there when England is at its darkest. Early morning before breakfast a refreshing and peaceful swim beckons. The stately pelicans glide by to their cliff edge tree roosts or sometimes spectacularly dive for fish. After breakfast you can have a lazy day reading on the lawn under the shade of a mango tree or on the balcony. Alternatively, you can always find a previously unexplored waterfall, bay, river or mountain, according to your taste. Shopping for provisions is not so easy unless you have a vehicle rental, which Colin always arranges for us. You can get practically anything in Whitchurch supermarket at Picard which is an easy half hour drive north. Locally you can get basic provisions, sometimes vegetables from Michel, the groundsman who keeps the lawn cut and farms an adjacent lot. The fact that you are looking at this site pre-empts my need to expand on the wonderful nature island of Dominica. More to the point is where you might decide to settle and sleep after your day exploring the island. I have been coming to Dominica for a number of years and the Villa Casablanca is my favourite destination after a day’s exploring. The panoramic views along the West Coast from the garden at sunset takes some beating and you have plenty of time to wake up in the morning before the sun pops its head up from behind the hills beyond the Macoucherie Valley and Mero Village. Should you decide on an early morning swim the beach at Mero is second to none and Salisbury beach is a 5 minute walk away. Even if you decide to have a lazy day at Casablanca, the wildlife will come to you with pelicans passing your nose on the cliff edge, frigate birds soaring just above your head and a wealth of small birds and butterflies going about their days business in the garden. After the glorious sunset the fireflies begin their display around the balcony to compliment the emerging stars and when all has finally settled into the night the reassuring sound of the lapping waves below you lulls you to sleep. Should you need any advice on any aspect of Dominica Colin and Cecily who live just around the corner are a telephone call away for advice or recommendation with their vast experience of the island having lived out here for some 15 years. So.... what are you waiting for!!! Wil +Lily are Jamaicans who spent their adult lives in Canada but have decided to move back to the Caribbean. Jamaica, however, has become too unsafe. On visiting Dominica in 2009 they fell in love with the island and the following year purchased some riverside land on which to build their new home. On their most recent 2 week visit in May/June 2011 they stayed at Casablanca on the mid west coast. We also had a small Suzuki jeep rental awaiting them on arrival at the airport. 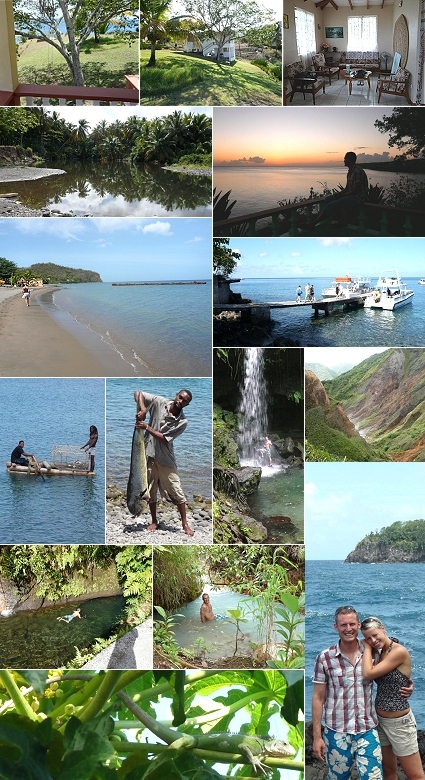 Dominica is the ideal place for us to be, because we both love nature (the natural environment of Dominica is superb). One of Dominica's many great assets is it's clean water. Visiting Dominica has made us want to be a part of such a peaceful and pristine country and one with such wonderful people. Getting to meet your family was tremendous and it reminded us of our observations and experiences when we first visited Dominica in 2009. For Lily and myself it would have been ideal to have met you both in 2010 and purchased property through Safe Haven. I must say I did get a lot of valuable information (and still do) on Dominica from the Safe Haven website. Staying at Casablanca was great for us as we found the residence to be central to every part of Dominica and most important - clean, comfortable and extremely quiet. Sitting and looking at the ocean and observing the ships and fishing activity taking place was very relaxing (my binocular was a great asset). We enjoyed the beach below the cottage and also the walk to the wonderful beach in the village of Mero. The trip that you planned for a day in the hills beside the river will always be memorable (extremely relaxing). Our afternoon at DOMFESTA was entertaining and refreshing as we got to sample a bit of Dominica's culture. I am planning another trip to Dominica soon to meet with our builder and intend to stay again at Casablanca. I will be getting in touch with you when I have a clearer picture as to the time I can be away. Nigel & Tania Harrison are from the south east of England and took their first Dominica vacation in February and March 2011, spending 3 weeks in 3 different parts of the island. First stop was Cherry Orchard Apartment in the Roseau Valley followed by a few days at Calibishie in the north then lastly, Casablanca on the mid west coast. We had a Courtesy jeep rental awaiting them on arrival at Dominica's Melville Hall Airport. Below are extracts from their detailed feedback. What did we think of Dominica? The island is a very beautiful place, we loved the vegetation, the rivers, waterfalls and valleys. It was really good to see crops growing that we haven't seen before i.e. banana, cocoa, coffee, sugar cane, pineapple, mango, coconuts (there were others we had no idea what they were). The rivers were so clear and we are always up for a good waterfall...Middleham was probably the most impressive that we saw. We did lots of snorkelling - the water was really clear most of the time with visibility about 30 - 40 meters. The people we found almost without exception to be friendly and helpful. People in the rural areas seemed to be the most friendly and even as we drove past would say hello or something similar (even when carrying the national all purpose tool...the machete). When we were walking one day we stopped to talk to a person who had obviously been working on the land and he immediately gave us some Grapefruit and refused to take anything for them. The accommodation that we got though your good self was really good. Nelista (Cherry Orchard Apartment) was a really nice person and made us most welcome. The accommodation was great too. We would recommend it to friends. Ivor's place (Casablanca) is an ideal location and had everything that we wanted. We would go back there again (and to Nelista's). I know that Ivor went out of his way to ensure that we had our own undisturbed space. The pricing of the accommodation was good and the vehicle we had did the job and on some of the steep and rough roads the 4 wheel drive was very good. Joris Visser and his girlfriend Barbara live in Enschede, Holland, Europe. They visited Dominica in May 2008, spending 1 week at Casablanca on the mid west coast and 4 days at Picard Beach Cottage Resort on the north west coast. We had a jeep rental awaiting them at the airport on arrival and also arranged a guide to accompany them on the all day hike to the Boiling Lake. .
Colin, We liked Dominica a lot! Here is our holiday report! Casablanca villa: A spaciously villa on an cliff, very nice views from the back garden (I wish I had it in Holland), the dated (but clean) furniture didn’t border us too much and it had a well equipped kitchen to cook meals yourself. The villa is owned by a very nice and helpful Englishman. Great value for money! Boetica: near the village of Boetica there is a nice (short) trail along the sea cliffs and at the end at sea level there is a natural “Jacuzzi” (a water filled hole in the rock where you can take a wave-shower). This hike is in the Bradt travel book. Hike upstream to the Bwa Nef Falls waterfall. Though we didn’t entirely get to the waterfall upstream, walking through the river was a very nice experience! This hike is in the Bradt travel book. Boiling lake hike: Take a guide for this hike. Our guide was great! (to bad I forgot his name, but it’s a acquaintance of Colin). The guide gave all the time we wanted, gave very good advices and had loads of biologic knowledge and stories of the surroundings. And the surroundings during this hike are very special and diverse - a must when you visit Dominica! Short easy hike to Emerald Pool (don’t go there when there is a Cruise ship in Dominica). When we where there was nobody around this popular place. Snorkeling and diving: snorkel at Scots head (walk to the small beach on the end of the peninsula) it is very nice above and under water!, On the north side of Cabrits is very good snorkeling (park the car near the beach near the road and walk/swim to the north corner of the Cabrits peninsula). I did some diving with the dive schools which were very good (Castle Comfort Dive Lodge and Cabrits Dive Centre). If you are interested in some colonial history visit Cabrits National Park, it has some nice ruins (overgrown by trees) and signs give directions and historical information through the park. We also saw land-crabs and (harmless) snakes there. Beaches: The white beaches are missing but in fact you won’t miss them. 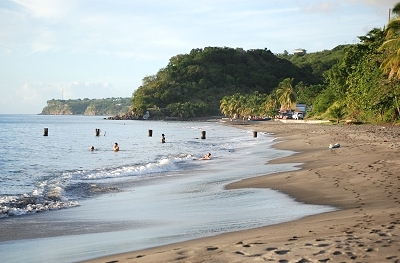 There are smaller dark colored beaches where you can relax/swim/snorkel a little bit. Go whale watching, We missed it because we waited too long and at the last day of our holiday the whale watch boat was canceled. Tips: We had the Bradt Travel Guide book, which helped us to do a lot of activities on our own. Even if you are adventurous, do some guided hikes so you hear some local knowledge and see some hidden places. Rent a 4x4 to discover the island (guided transport is also possible but you will miss the “freedom feeling” a little bit I think) and try to avoid driving in the dark (our plane arrived in the dark and it’s not very nice to drive in the dark because of the curves, gaps, cliffs on the narrow roads). We flew from London to Antigua and had a laidback week there on the beautiful white beaches (not much else to do there) and then we flew with Liat airways to Dominica. We liked that relaxing/activity combination of two islands a lot! Colin’s booking service is great, not too commercial and very good help (also his website http://www.natureisland.com/ gives good information). Tim & Shelly Mooney live in rural Nova Scotia, Canada. Tim is an IT specialist, Shelly a nurse. They spent 2 weeks in Dominica in March/ April 2006, spending 1 week at Ginger Lily Cottage in the east, 6 days at Casablanca on the mid west coast, and their final night at Calibishie Lodges, convenient for their early morning departure home. We had a jeep rental awaiting them at the airport on arrival and also arranged a birdwatch outing, including packed breakfast and traditional lunch, with Dr. Birdy, plus a guide to accompany them on the all day hike to the Boiling Lake. .
Just wanted to provide you with our thoughts on our recent stay in Dominica… Discovering Dominica has truly been a memorable experience; from the moment we flew into Melville Hall, arrived at the “Ginger Lily”, moved on to the west coast to “Casablanca” and then on to Calabishie we thoroughly enjoyed each and every day. We have such fond memories of the warm and friendly people we met in Riviere Cirique during our stay at the Ginger Lily; everyone on the island is friendly and helpful. The sights we saw were truly amazing and everything is still so pristine; Sari Sari falls is a must see as is the Secret Beach. Being able to walk for hours through the rain forest with no sign of anyone is an amazing experience. All this and no bugs! On to the south west coast and the Casablanca; amazing sunsets over the Caribbean with no one else in sight. The local rum factory where the rum is made from sugar cane grown on the property and water from the Macoucherie River. More hikes into the mountains and a multitude of fresh fruits along the way. Two local favorites – Kubuli beer and the local grapefruit – so sweet. Thank you Colin for all your help in arranging our exquisite accommodation and the most informative hike through the Syndicate Forest with Bertrand; he is definitely a fountain of knowledge regarding the local flora and fauna. Thanks to Fernanda for making our stay at the Ginger Lily so comfortable and the first meal on the island a memorable one. We would highly recommend either of the accommodations as well as the Calabishie Lodge and of course Nature Island Destinations to anyone who wants to experience an untouched Caribbean island and the natural wonders it has to offer…. One word of caution on the driving; new drivers beware… the roads are very narrow and winding and contain a wealth of potholes. Defensive driving is a must. Again thanks for all your help and have a great summer. Linda & Helmut Huber live in Leimen, near Heidelberg, Germany. They visited Dominica with their 2 children, aged 10 & 12, for one week in mid April 2004, staying at Casablanca, a three bedroomed furnished house with balcony on a cliff above the sea, near Salisbury, mid west coast. We also arraged vehicle hire for them and diving with nearby East Carib Dive on Salisbury Beach. They like the island so much that they are now considering their next visit, or maybe even returning to live in Dominica. I am sorry that it has taken so long to respond to your e-mail. We loved Dominica. My children are still begging to go back so I am sure we will return. We spent a week on the Island, but we would have preferred to have had more time. We could not take part in any of the tours for this reason - we took the dive class for a week. Next time! The accommodation was fine and we would love to book it again. All in all we fell in love with the island and hope it stays just the way it is. After having the small talk with you on your veranda, I often think that it would be a great idea to follow suit -- pack it all up here and leave this rat race. I hope you and your family are doing well. We really do want to come back and will definitely contact you for our arrangements. It was a pleasure working with you to plan our trip and of course you were very helpful! Adam and Clare Partridge are a young couple who live in Winsford, Cheshire, in the west of England. They have visited Dominica on two occasions, both of which they spent at Casablanca, a three bedroomed furnished house with balcony on a cliff above the sea, near Salisbury, mid west coast. We also arranged vehicle hire for them. They like the island so much that they are seriously considering returning to live in Dominica. Update: since this entry was made almost a decade ago, Adam & Clare have returned to Dominica many times, the most recent being March/ April 2012. They have now purchased land in Mero where they intend to build their home. Just a quick note to thank you very much for organising our holiday. As I am sure you are aware we had a wonderful time and did not want to leave. England is as depressing as ever particularly here in the North West ! Some photos came out quite well - I may scan some and send them to you in due course. anything you have available - land, housing etc. Thanks again - it was a pleasure to meet you and I would have no hesitation in recommending your services.